Our _______ is taking a group to Haiti to help with disaster relief. The kids _______ by the library on the way home. Very few people have been to Mt. Everest's ________. The woman ______ over the article in the magazine. He ________ to a previous moral indiscretion. I do ________ your sincere apology. My family and I ________ from France 8 years ago. The comedian hoped his jokes would ________ a great deal of laughter from the audience. It was a ________ between good and evil. The storm ________ everyone's ability to work. The U.S. ________ building is in Washington DC. Don't forget to get ________ car keys? His feet slipped on some ______ gravel when he was jogging this afternoon. Don't go over ________ because it's too dangerous. There are _____ many cooks in the kitchen. You got over 30% correct but you didn't quite try your best. The questions aren't that hard if you take a look at all the options available. You can do really well. Go back one more time and try your best! Good job! You performed at a champion level on this test! You're in the top 12% ranking! 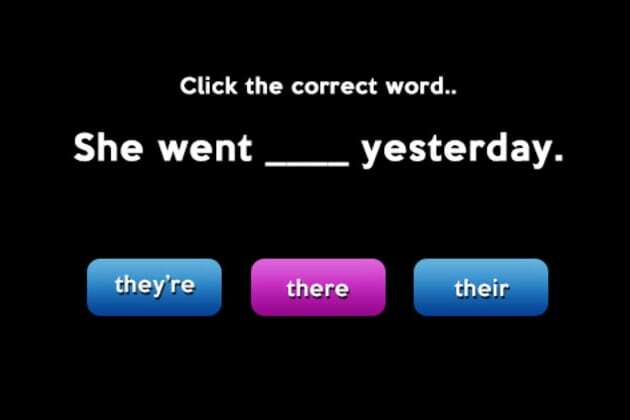 This test included questions which had some of the most misspelled words and phrases in the English language. A lot of people fail this quiz because they confuse elicit/illicit, alluded/eluded, and some even misuse to/too/two, but you know your grammar and spelling exceptionally well! Congrats! You performed at an expert level on this test! You're in the top 3% ranking! This test included questions which had some of the most misspelled words and phrases in the English language. A lot of people fail this quiz because they confuse elicit/illicit, alluded/eluded, and some even misuse to/too/two, but you know your grammar and spelling exceptionally well! Wow! You performed at an absolute genius level on this test -- that is the highest possible score that anyone can achieve. You're in the top 1% ranking! This test included questions which had some of the most misspelled words and phrases in the English language. A lot of people fail this quiz because they confuse elicit/illicit, alluded/eluded, and some even misuse to/too/two, but you know your grammar and spelling exceptionally well! We'll give you tricky sentences. See if you can pick the correct word!